Facebook is now become the fastest growing Social Networking website as compare to others because its providing most advanced and updated features to its users so if you're too addicted Facebook user and wants to enhance your ability of working on Facebook either doing personal work, professional work or working socially or if you own a Facebook Page, Facebook Profile, Facebook Group, Facebook Application or you're a Facebook Developer following New and Updated Keyboard Shortcut Keys List of Facebook will boost-up your certain work on Facebook and provide you ability to work more efficiently, fast and more accurately. We are going to share Keyboard Shortcut Keys of Facebook for different and most popular Web Browsers so that you can do your work on any platform. 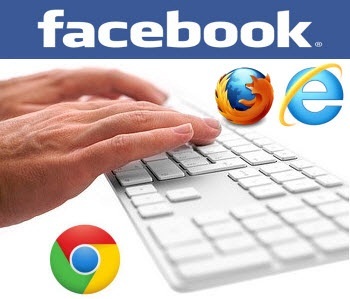 We have summarized the List of New and Updated Keyboard Shortcut Keys of Facebook for Chrome, Firefox and IE Web Browsers, all shortcut keys are updated and works perfectly with Google Chrome Web Browser, Mozilla Firefox Web Browser and Internet Explorer Web Browser. 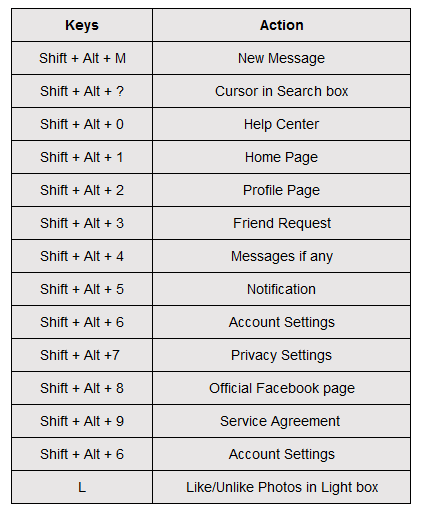 Facebook Keyboard Shortcut Keys for Web Browsers will minimize the usage of Mouse and will provide you ability to work with your keyboard only, through which you can do your work more fast with speed. 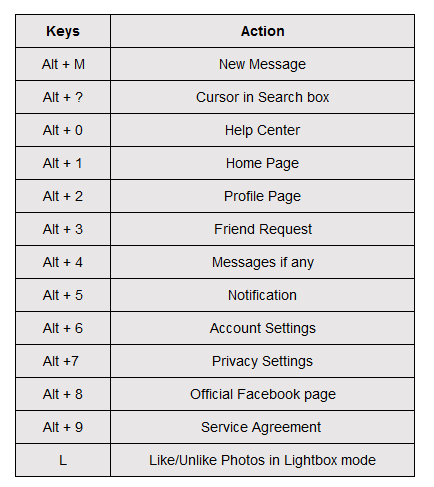 You can use these Facebook Shortcut Keyboard Keys for most commonly use Facebook features and options without the help of your mouse. It doesn't matter which Web Browser you're using you just have to use different combination of Keyboard Keys for different tasks and features of Facebook, for example; if you're using Chrome Web Browser than you just have to use the two combinations of keys ALT+? (with any defined keys in chart below) same like if you're using Mozilla Firefox Web Browser than you just have to use three combination of keys SHFT+ALT+? (with any defined keys in chart below) and if you're using Internet Explorer Web Browser than you just have to use three combination of keys like ALT+?+Enter (with any defined keys in chart below). 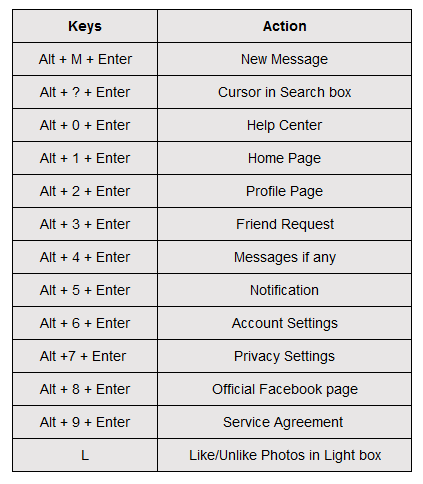 So let’s have a look of Chart of Keyboard Shortcut Keys of Facebook for Chrome, Firefox and IE Web Browsers.